Net-a-porter is home to some of the world's most premier designers, but there's often a sophisticated, classic edge to the clothes that they feature. There are wacky, trendy, and overall just ridiculous pieces too, but they tend to stay relatively safe. 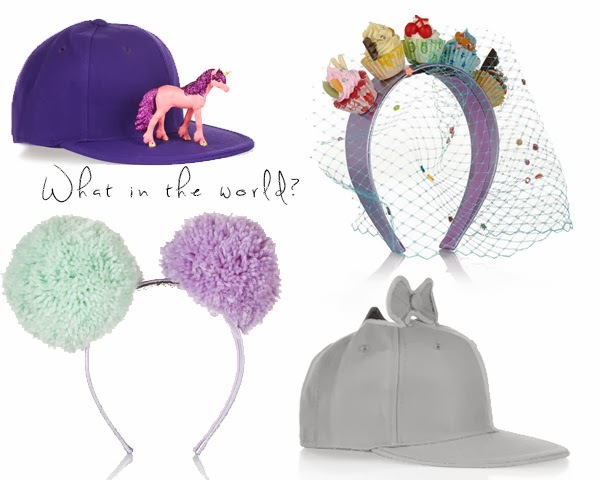 But among the New Arrivals section is a series of elaborate & whimsical headgear. British Milliner Piers Morgan is the brainchild behind these deliciously wacky hats and headbands. He's been around for a while, with celebs like Anna Dello Russo and Lady Gaga wearing his designs, but I've only recently stumbled upon this headwear designer and thought I would share his creations with you! As insane as these items are, they are relatively tame compared to some of the other pieces available for sale on his official website. Be warned, these are high-fashion headbands and will cost you (most were over $500) but they are truly unique if you're looking for a good statement piece!